Buckle yourselves in children, we’ve a lot of drag to get through. Saturday saw the return of Meths’ Apples and Pears - including the very first all ages show! That meant teenagers. I know, I know. Most of them are little sh*ts. But these teenagers were a good bunch, and who doesn’t want to see a very small child bopping along to a very tall woman dancing on stage? The (almost) whole family turned up - minus Sister who was working, and Tayce, Cara Melle and Cheryl who were ill - and turned out the best show. Despite the occasional swear word, to the delight of the adults in the audience. Apart from the parents, probably. But they tried, they really did. There was also an evening show, and for some godforsaken reason I made the commitment and stayed to both. Despite the fact I could have seen a show and gotten a deliciously early night if I’d gone home after the first show. I make sacrifices for these queens (and king), and as ever - they did not disappoint. The words were remembered, the tech went beautifully thanks to husband Joe and Flynn, and everyone was on top camp form. Right. Must get on. A two show post is never a short post, especially when the first show contained seven different performers. Seven. A right treat in anyone’s book. And as ever, we’re going performer by performer because it’s so much bloody easier. On to the first show! The running gag of the evening, courtesy of the delightful Meth (who I don’t think actually said her name in front of the children - probably for the best) was using the song ‘Stop!’ to get the audience to shut up and pay attention to her. Most excellent. Lit by the, uh, ‘flattering’ upwards lighting, Meth treated her adoring audience throughout the night - no, afternoon, the thing started at 4pm - to a couple of her most iconic (and child friendly) numbers. First: the iconic Professor McGonagall mixed with Iggy Azalea’s ‘Fancy’. I’ve said it before and I’ll say it again - this number does McGonagall complete justice, and I’ll never be able to watch the films in the same way again. I like to imagine Maggie often dances around to Fancy, because she is. Very fancy. Much like Meth herself. Second number - a mashup of the Power Rangers and the Spice Girls. Not a mix I thought I’d ever see together, but definitely two iconic groups with a lot in common. Meth explained the number as being an homage to her childhood in the 90’s (1990’s, not 1890’s), which worked perfectly with so many young un’s in the audience. Did half of them even know who the power rangers were? Are they still relevant? No idea. Anyway. Meth’s number was brilliant, and watching her ‘fight’ invisible enemies to the power rangers theme tune is a sight I’m not going to forget in a hurry. See that in my dreams, I will. Next up: Ophelia Love. She’s featured here many times before, because I go to nearly every show she does like an absolute mad woman. She’s not the mad woman, I am. Anyway. Clad in a black glittery velvet(?) frock - with the tiniest waist - and the most delightful half-up curly hair, Ophelia gave us her ‘family friendly’ Hermione number. Family friendly Hermione might be, but one of the songs included in the mix not so much. Ever dropped the c-bomb in front of children? Well, Ophelia has now. Hilarious, to be quite frank. It’s an excellent number, despite the swearing, and Ophelia sells the character of Hermione a little too well. Her second number was one I have been waiting for for so long. For many months now, since I found out it was a thing, I’ve been obsessed with the musical SIX - mostly because I am a giant Tudor nerd. The soundtrack is insane, and I can’t wait for the musical to come back to the West End. I just need to find someone who will actually go with me. Anyway. SIX. Finally, finally I got my wish (well, one of them) as Ophelia took to the stage as Anne of Cleves (although she’s more of a Katherine Howard, if you ask me (no-one did (but the description in my Wives of Henry VIII book describes Katherine as an empty-headed wanton (JOKE)))) and performed ‘Get Down’. Which is one of the best numbers from the whole musical, to be honest, despite Anne being a reasonably boring wife. No dramatic divorce, no head lopping, just a tidy sum to live off of and no having to be married to a maniac. It was an incredible performance, and Ophelia looked stunning in a pink gown. Truly everything I ever wanted. We’ll go to Kitty next - nice segue here as she also did a number from SIX. I know, I know. Truly spoilt. Again, she’s more of a Jane Seymour (I know she’ll do the ballad one day and that is the day I will die), but she did a beautiful lipsync to ‘Don’t Lose Ur Head’ which was the first song from the soundtrack which I became obsessed with. Highlight of that performance - Kitty using her hands and mouth to spell out the word ‘LOL’. Quite frankly, not normal. But very, very funny. 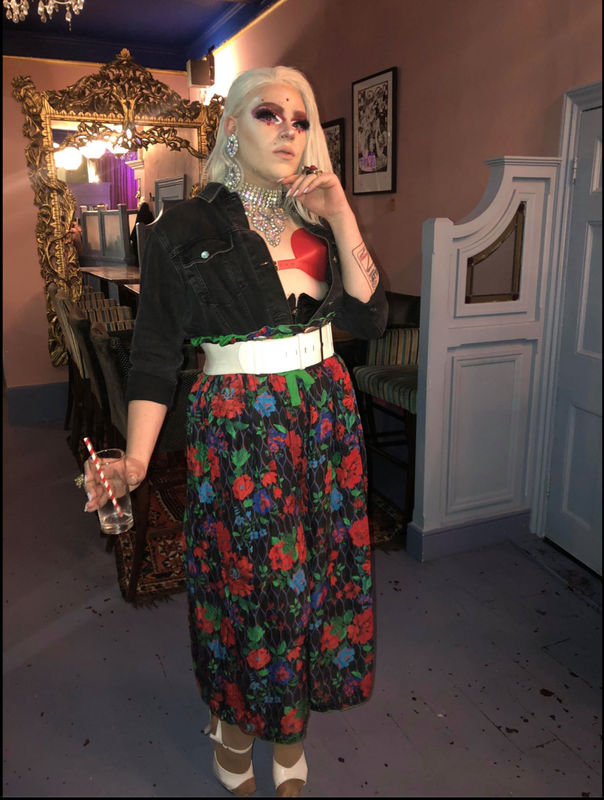 Kitty was dressed in a darling black mesh bodysuit paired with some floral trousers and matching kimono - very camp, very gorgeous. She also sang ‘Part of Your World’ - and made it past the first 28 seconds, which is the most shocking part of the whole thing - and I think she did it mostly to have the excuse to sit on a chair and flap her fins. I mean, same. And I do love that song. Drag queens and Disney? Totally here for that. Now. Glew. She’s described herself as a ‘groovy girl’, and I wouldn’t disagree with her. Dressed ‘French’ in a Minnie Mouse-esque red dress with white spots, Glew performed what is possibly her greatest piece ever. Set to Girl’s Aloud ‘Can’t Speak French’, Glew intersperses in little bits of crap French speaking. And by crap French speaking, I mean Glew recorded herself speaking French, and singing that je ne regrette rien song. Absolutely mad. Completely ridiculous. And also, hilarious. I died laughing the first time I saw her perform it, and I died laughing the second time. Love her so much. Camp tart. Up next, the queen who changed her name, quit drag a month ago for a week, and made a startling recovery complete with massive glued on eyebrows: Joy Less! Always a camp treat, dressed like some kind of Florence Nightingale in a long pink nightie, Joy gave us the MIKA moment we’d all be waiting for. Well, not waiting for. But the MIKA moment we deserve. ‘Grace Kelly’, to be exact. Which is one of his best songs, and Joy was the perfect person to take on the iconic number. Side note: I love Joy’s eyebrows. Massive zig zag pieces of paper glued to her forehead and making her look a little on the side of surprised constantly. Absolutely brilliant. Ah, Flynn is next. Flynn who is holding onto Halloween with his little hands as hard as he can, despite it being Christmas now. You can fight me about that, the minute Halloween ends Christmas starts. Anyway. Clad in gold sequins from head to foot, Flynn took to the stage and gave us an ABBA moment with ‘Kisses of Fire’ (full disclosure, Glew had to tell me the name of the song because I am a bonafide idiot), and ended with a touch of Meatloaf. Nearly called him Meatball. Two different people. I have it on good authority that Flynn is more than a fan of a bit of Meatloaf, but luckily he gave us the one everyone knows - ‘Bat Out of Hell’. I often feel like a bat out of hell. Nice little interlude in the show. I’m sure all the children knew the song inside out and back to front, I hear it’s popular in nurseries. And to conclude: HERR. The campest of the camp, the most ridiculous of the bunch, lipsync extraordinaire and all round great person. Dressed in leopard print(?) top, black trousers, and Elizabethan ruff around the neck, HERR treated us to two of her most well-known and iconic numbers. First: Countdown. Specifically that episode where Carol Vorderman could not do the maths and had to get her calculator out because the man had done it, and mixed with that classic song ‘Complicated’. A right treat for the children. Her second number is my personal favourite, because I have a deep set love for all things Shakespeare. My name, in fact, comes from the delightful youngest daughter of King Lear - the best Shakespeare play. Anyway. HERR takes the song ‘Tragedy’ (along with the dance moves), and mixes in various soundbites from different Shakespeare tragedies. See where she’s going with that? Hilarity at it’s finest. The highlight is that bit from Hamlet about Ophelia. Most excellently done, HERR is wasted on drag and should be doing Shakespeare. And thus our afternoon concluded, and all the teenagers and children f*cked off so that the not so family friendly entertainment could begin. And boy, did Glew show us that this really was an 18+ show. 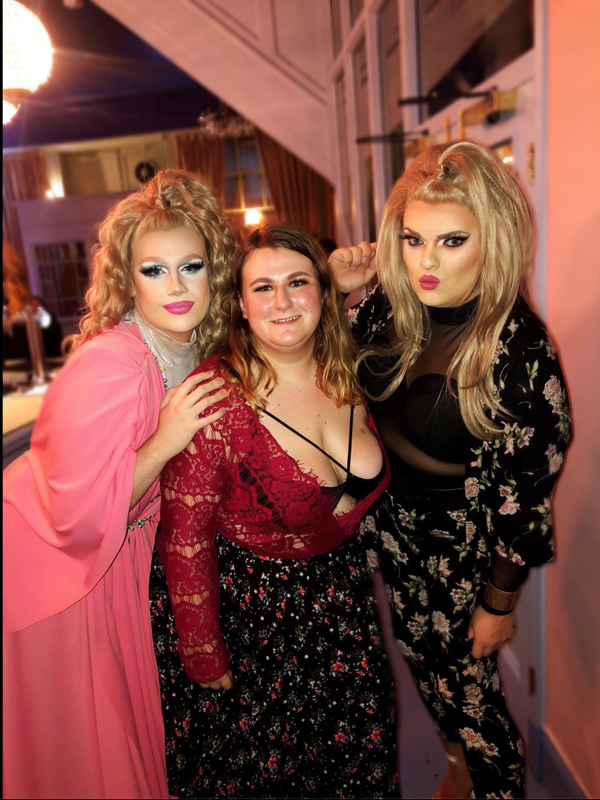 Taking to the stage in floral trousers that I really want to just wear to work every day, red leather bra (that wearing to work might cause a riot), and Flynn’s black jacket, Glew proceeded to treat us to her first ever(?) drag mix - about touching herself. Yes kids, we’re not in Kansas anymore. Or not kids - the kids have gone now. She even brings out a pillow with ‘her’ on it. Delightful? Maybe not. Hysterical? Absolutely. Glew also gave us two of her best numbers - ‘Push The Button’, with added button pushing appliances including but not limited to a microwave, a blender and the Grindr notification, and also her iconic ‘I Will Always Love You’ with that kid singing who sounds a lot like Flynn singing. Of course, as the host, we also got Meth back on stage to entertain the masses in the way that only she knows how to. Starting with her ‘Memory’ from Cats piece, where she forgets the lyrics, has to look at her arm where she has ‘written them’, and eventually asks an audience member to google the lyrics. Follows the KISS principle (keep it simple, stupid), but just works. No-one else could do it, which is why she’s the foster mother. She also gave us a drag race inspired number, because the cast for All Stars Four had been announced the day before. 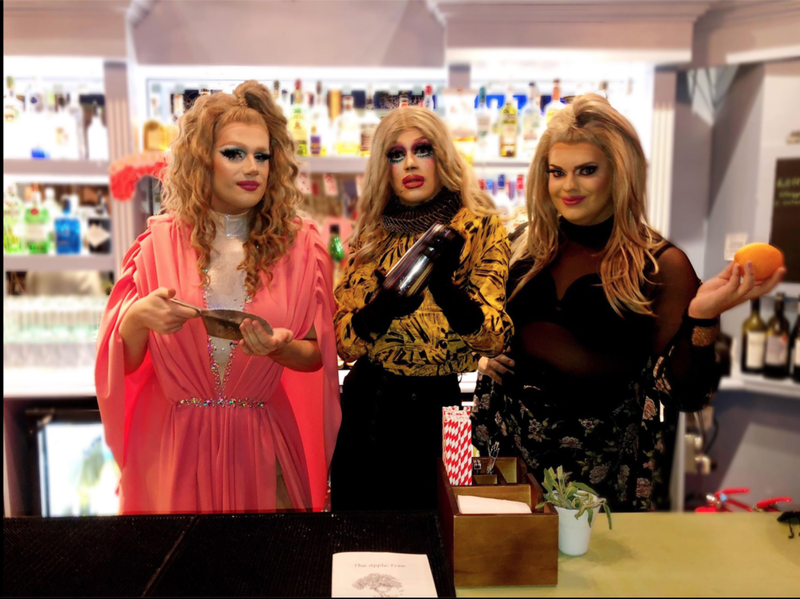 Side note: didn’t AS3 finish like yesterday? It feels like no time at all has past, but it’s only a month or so until drag race is back in our lives. Anyway. 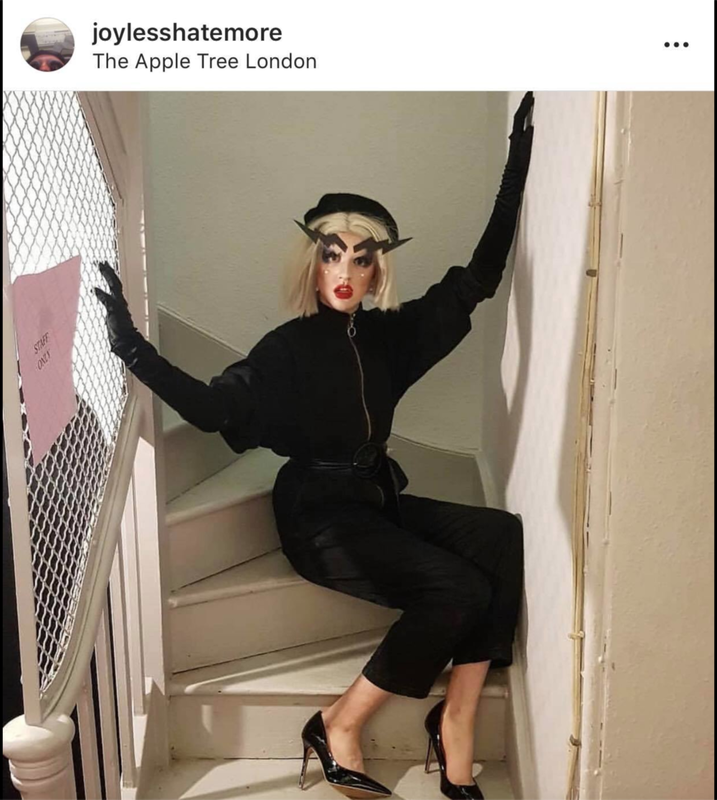 As a UK queen and therefore without the fame of a RuGirl, our darlings often find themselves subjected to people telling them which queen from RPDR they look like. Obviously - this does not please them too much. And that’s what Meth’s number is all about. Taking ‘That’s Not My Name’, Meth replaces the different girls names with different RuGirl names. Perfect, and gets her point across nicely. She finished with what is my favourite mix of hers, ‘As Long As He Needs Me’. It’s my most favourite song from any musical ever, as my friends will tell you, and she finishes it with several different, iconic, big moments from other musicals. It’s beautiful, and I love that song so much. Ms Scoot-Claus also came back to entertain us for the evening, having removed her trousers and replaced them with the most gorgeous pair of thigh high black latex boots. I love when Kitty does a leotard look. Or bodysuit. Whatever you want to call it. You can take the girl out of ballet but you can’t take ballet out of the girl. Anyway. Once more proving that this is not an all-ages show anymore, Kitty sang a little rendition of ‘2 Become 1’, which I’m convinced she only did to remind us all over and over again that she got Spice Girls tickets. Over and over again. A solid 90% of the lyrics were changed to ‘I got Spice Girls tickets’. She also sang ‘Let It Go’, which she does beautifully, and treated us to her ‘Boots Were Made For Walking’ lipsync which also includes lines from Melissa McCarthy and Rebel Wilson from those romcoms that they’ve done. Perfect for Kitty, honestly. They’re big women, she’s a - you get the gist. And it’s really, really funny for the audience. And finally, to round out what feels like a marathon of a post, the special guest for the evening Mark Anthony. Winner of NADC season 5 (I believe), Mark is a fabulous drag king who treated us to three different numbers and had three different outfit changes. Now that is something you don’t often get. This is also where my notes fail me. All I have written for his first number is ‘that faith song’, which really tells us nothing about what he actually did, because I do remember there were a few different songs included. I think he did a touch of burlesque too. And by that I mean I don’t really remember because at this point I’d been at The Apple Tree for so long and I was losing my mind a little bit. Mark’s second number was all about contemporary dance, and boy did it give me flashbacks to BTEC dance class. Contemporary is my worst style, I’m too much of a ballet dancer, but despite it being a comedic version of how contemporary dance moves are taught it was far too accurate. Have a serious conversation with your knee? Been there. Try and hug someone like your elbows don’t work? Done that. Loved it, took me back to my dancing days, reminded me that I never want to do contemporary dance again. 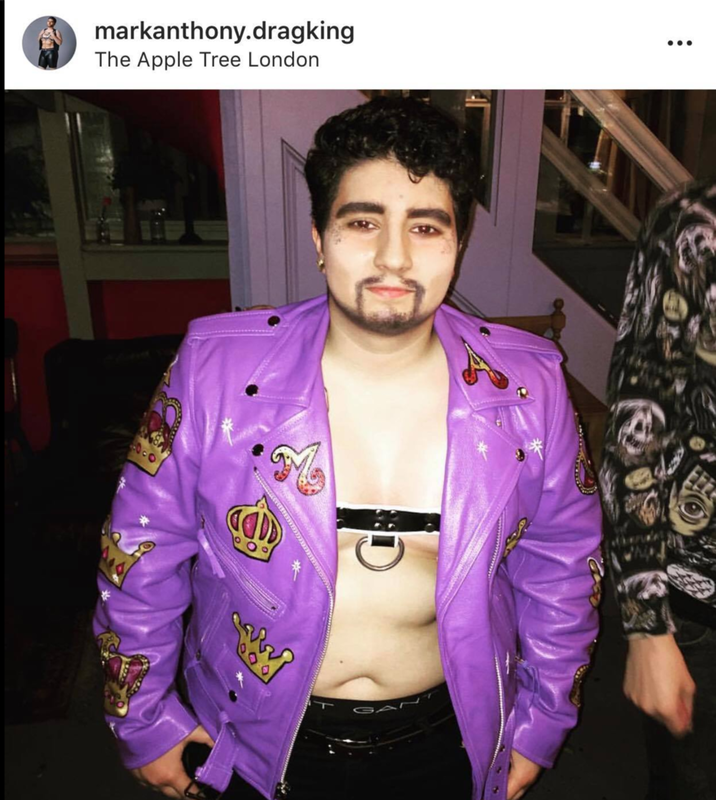 His final number took us to a more serious moment, as he did some lipsynced spoken word about being trans and dysphoria. Using the line ‘mirror mirror’ over again, the words took us through how someone might feel looking in the mirror. It was excellently done, and finished out the long day of drag nicely. And there we have it. Eight hours of drag condensed into over 2000 words and my fingers hurt from typing. The next Apples and Pears is on the 24th November at The Apple Tree in Clerkenwell. Go. It’s a fiver if you get early bird, and the lineups are always incredible, and pub even does vegan food! You have literally no excuse not to go.